So why do emails bounce? What do I do if an address is put on hold? What is the difference between opting out and unsubscribing? What does the privacy option 'Do not email' mean? How can I make sure a contact doesn't receive any emails? In the setup chapter we discussed setting up and configuring Email lists. In this chapter we are going to delve a bit further into list management and discuss compliance. It is important that you keep you email lists healthy with low rates of bounced emails and unsubscribes. There is always fear of the dreaded 'blacklist' if you have very high bounce rate, or the fear of being scolded by your SMTP provider for the same. However, the reality is high bounce rates and unsubscribes typically represent a deeper organization issue... and that's really scary. Each time you send a bulk email from CiviMail it's possible that some of the emails will bounce. Hopefully, only a few. Bounces happen for many reasons; some may be temporary, others permanent. CiviCRM handles different bounce types differently. Whereas temporary bounces will have no affect on a contact record and CiviCRM will attempt to send future mailings to this address, permanent bounces may put a contact email on Hold. When an email is on Hold, no future emails will be sent to it unless someone fixes it and removes the hold. Basically you have two options if an email address gets put on hold. You can either unhold them or fix/delete them. Once you have the list of contacts with held email addresses, select them and choose the action Unhold Emails from the dropdown list and click Go. The report will show contacts whose emails have bounced. You can then open Report Criteria at the top of the mailing to limit the report to a specific bounce type. From here you add the contacts in your search results to the group you first created. Pull up the group via Advanced Search. It is also recommended that you select Email on Hold to avoid querying records that have previously bounced but may have been already updated. Select Batch Update via Profile for all the results whose email addresses you can correct/update. This will require a profile in place that contains just Primary Email. Select this profile and click Update. Email recipients who unsubscribe from a single mailing list will simply be removed from the group you used as a mailing list to send to. Email recipients also have the option of not receiving any bulk emails from you by clicking a link you provide in every mass email. This is called "opting out". You can still send individual or small volume emails to someone who has opted out using the Send Email action which is accessible via the contact's record or after a search. Scheduled reminders will also still be sent to contacts who have opted out. You should be very careful about the emails you send to someone who has opted out if you do not want to be accused of sending spam. You can include these tokens directly in the body of your mailing or in a footer message. 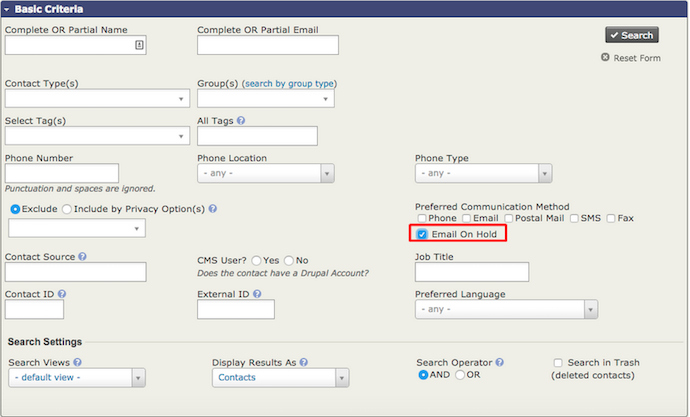 If a contact has this option selected then you will not be able to send them individual or small volume emails using the Send Email action reached via the contact's record or after a search. They will not receive bulk emails sent through CiviMail, either. However they will still be sent scheduled reminders unless you specifically exclude them from those reminders. If the Do not email option is set manually after someone has contacted you in person, it is probably a good idea to exclude them from scheduled reminders. The Schedule Reminders chapter outlines how to do that. Due to user error, there is always a chance that someone could change CiviCRM settings incorrectly or manually misuse an email address. The only way to fully guarantee that a contact doesn't receive any emails is to remove all email addresses from the contact's record. However, in this case the contact would not be able to log in to your website.